The Japanese love their soybeans! No wonder most Japanese people are so healthy. Soybeans are legumes and part of the pea family that is the world’s major food crop today. They are also processed into oil, milk, tofu, and soy protein. The two major variety of soybeans cultivated are the yellow and black. They are also known as Edamame in China and Japan. Soybeans are low in fat and calories and are a rich source of protein, fiber and many other essential vitamin and mineral. Soybeans are useful in many medical conditions and symptoms too. Is soy good for you? Yes, it is. They are consumed in numerous ways – roasted, sprinkled with salt and boiled. Soybeans are often used as meat substitutes. This has many health benefits and is an ideal supplemental source, especially for vegetarians. A well hydrated skin is a must, when it comes to keeping the skin healthy. Soybean acts a moisturizer for combination skin and is also useful to get rid of dry, flaky skin. If you have oily skin, you can use this amazing bean to remove the excess oil from your skin. Soybeans can also reduce the visible signs of ageing like skin discoloration, wrinkles, dark spots, fine lines, etc. As we age our body tends to lose estrogen, the vital hormone that maintains skin elasticity. The phytoestrogens in soybean helps to produce more estrogen in the body to reduce wrinkles and fine lines. Soybeans contain vitamin E that can help to renew dead skin cells and also form new skin cells. This can help you look young and radiant. Crush soybeans with little water and apply it on the face. Leave it on for 20 to 25 minutes to moisturize your skin. Use this concotion three times a week for best results. If you have brittle nails, soy can be the best thing for you. Include it in your regular diet for six months. This will help strengthen your nails and also add shine. Soybeans are also known to moisturize your nails and treat nail fungus infection. Just dip your nails in soy sauce to get fungus free nails. Check out here some of the best benefits of soybeans for your hair. Soybeans are also used for smooth, soft, and shiny hair. You can apply soy bean juice onto the hair regularly for three months to get the desired results. Here mentioned are some of the best benefits of soybeans for your overall health. Soy oil, like algae and oily fish, is loaded with omega 3 fatty acids. This protects the body from various cardiovascular diseases. Soy has phytic acid that acts as an antioxidant. This can combat many diseases like cancer, diabetes, inflammation, tumor etc. Soybean is rich in iron and zinc. It helps in expanding capillaries, soften red blood cells, and stimulate blood supply to the ear. This can prevent hearing loss in elderly people. Soybeans have the ability to improve our blood lipid profile. Soy milk is high in unsaturated fat with zero cholesterol. The monounsaturated and polyunsaturated fatty acids in soybeans prevents transportation of cholesterol in the blood stream. If you want to lower the blood concentrations of triglyceride, (LDL) and increase the level of (HDL), try consuming soy regularly. Soybeans contain powerful phyto-antioxidants like omega-3 and omega-6 fatty acids that can protect the blood vessels from lesions and hemorrhage. This nutrient is useful in binding blood vessel lining and helps to defend the lining cells for free radical attacks and deposit of cholesterol. The binding process boost the fluidity and flexibility of the blood vessels that helps to regulate the body’s blood pressure. 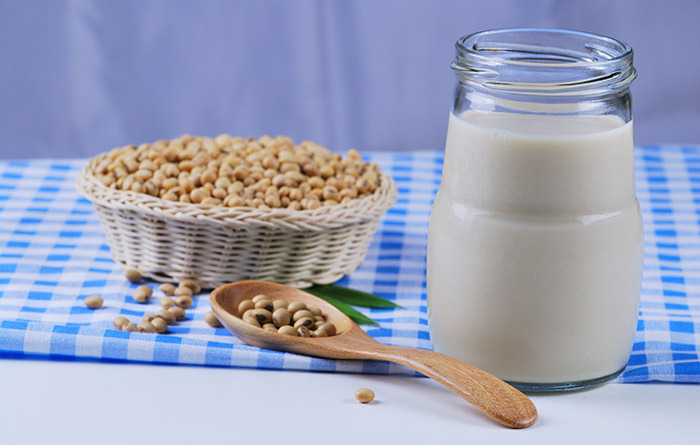 Soy milk, obtained from soybeans, is low in sugar content when compared to other milk. Whole soy milk contains only 80 calories like skim milk. The monounsaturated fatty acid in this milk can prevent the intestinal absorption of fat that aids in weight loss. Soy is a rich source of phytoestrogen. This is a unique plant hormone that prevents testosterone production in men. This reduced testosterone levels helps to lower the risk of prostate cancer. During menopause, the estrogen production in a woman’s body takes a nose dive. This sudden drop of estrogens can cause many health problems in postmenopausal women. They are at higher risks of disease related to the heart, diabetes, and obesity. This can also cause depression, mood swings, insomnia and various other psychological disorders. The phytoestrogen content in soybeans are effective as an estrogens replacement. Consume soy regularly to prevent and cure postmenopausal syndromes. Most women are prone to Osteoporosis. This disease is caused due to age and weakening bones. The phytoestrogen content in soybean can boost calcium absorption by the body and prevent bone mass loss. To avail maximum benefit, consume soy milk fortified with vitamin D and extra calcium. Soy is also a good substitute for milk in infant feeding formulas. This acts as a good alternative to cow’s milk. Eat soybean as a dietary protein to reduce the total cholesterol and “bad cholesterol” level in your body. Soybeans are high in good fat or polyunsaturated fats that lower LDL or bad cholesterol levels. Consume 50 g of soy each day to lower your LDL cholesterol by 3%. Soybeans can reduce the risk of developing breast cancer. Women who consume soybeans regularly are less likely to develop breast cancer. Soybean is loaded with plant protein that can boost immunity and reduce fatigue. Consume soybean as a protein supplement and avoid the cholesterol that comes with eating meat. Soybean contains lecithin that is vital nutrient for the brain. Consuming soybeans can help patients suffering from Alzheimer’s disease. It also contains phytosterols that increases the function of nerve cells in the brain. Soybean can help in stimulating absorption of fat-soluble vitamins. This helps strengthen the tissues and organs of the body. Soybean is also known to lower cholesterol level in the body, improve the lipid metabolism, and prevent coronary atherosclerosis. The protein content in soybean can stimulate the cerebral cortex. This is useful to improve the efficiency of learning and work. This can also alleviate your depressed and gloomy mood. The soybean saponins work as an antioxidant, to clear the free radicals in our body. This also reduces the growth of tumor cells and strengthens the immune function of the human body. Soybean contains plant sterols that reduce the cholesterol level in blood. This competes with the cholesterol in your intestines and reduces its absorption. This also lowers the level of “bad cholesterol” in the patient of hyperlipidemia. High blood pressure patients tend to consume more sodium and less potassium. Potassium rich foods can expel the excess sodium from the body. This can help bring down the blood pressure of t the body. Soybean contains a good amount of potassium. So, if you are suffering from high BP, you can consume soyabean to provide your body with the potassium it needs. Soybeans help in the prevention of type 2 diabetes. It can reduce insulin resistance by increasing insulin receptors synthesis. But this only occurs in the presence of other essential dietary supplements like good amount of polyunsaturated fat. Good level of soy intake can decrease the risk of type 2 diabetes and other chronic health problems. This can also prevent other problems related to insulin metabolism and blood sugar. Calcium content in soybeans helps to build and develop strong bones and teeth. Soybeans contain Zinc that helps in boosting the body’s immunity. This is also useful to heal wounds and perceive taste. Soybeans contain antioxidants that cleanse the body and flushes out free radicals from the body. Soybeans contain anti-inflammatory properties that help people suffering from arthritis and other inflammatory conditions. This can be consumed as a side dish or a snack by asthmatic people to heal inflamed breathing passages. 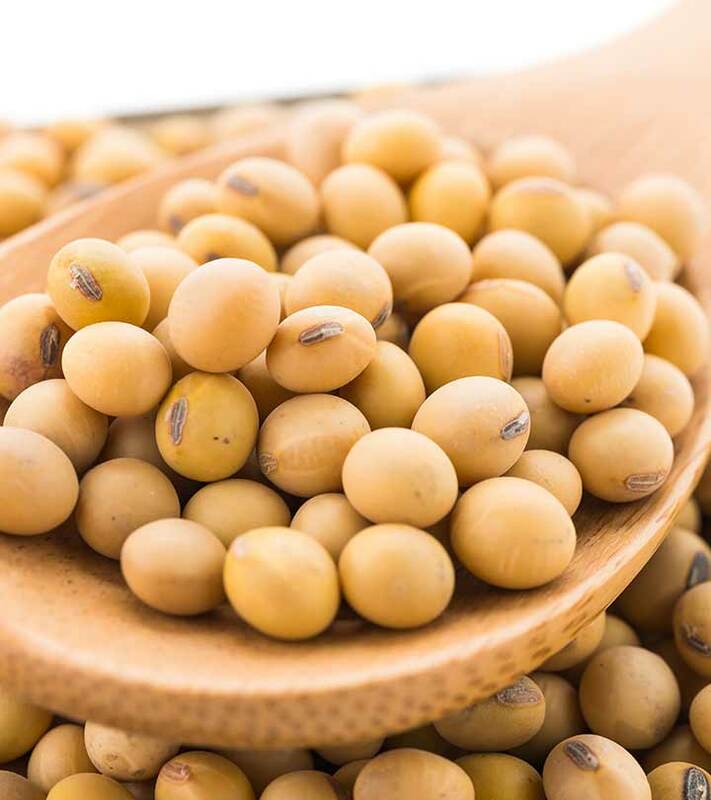 Soybean seeds are a rich source of vitamin B, C, and E. These seeds are also full of essential nutrients like calcium, manganese, phosphorous, magnesium, iron, and copper. Vitamin K and folate helps in blood cells production and folic acid is required for fetal development. Pregnant women can consume soyabean to ensure that their body gets the requisite amount of nutrients for the proper development of fetus. Folate, which is abundant in soybeans, helps in the production of serotonin. This is useful to get rid of depression and improve your mood. Magnesium in soybeans can reduce the risk of migraine headaches. So, if you are prone to those debilitating headaches, make it a point to include soyabeans in your regular diet. Whole green soybeans are a rich source of omega-3 fat known as, alpha-linolenic acid (ALA). This works to reduce inflammation and many other cardiovascular diseases. Soybeans are rich in omega-3 fatty acids and folate. These vital nutrients are useful to protect against arthritis and their symptoms. Natto- a traditional Japanese food prepared from fermented soybeans. Soy Crisps- soy chips made from soy flour. Soy Nuts- crunchy snack food. Soybeans are considered safe during Pregnancy and breast-feeding. But ensure that the quantity consumed is within normal range. Excessive consumption of Soybeans protein during pregnancy can harm the baby. Soy is also safe for children, when taken in normal amount. Soy milk can cause nutrient deficiencies, when taken regularly. Children allergic to cow’s milk must not be given soybean. Soy products increase the chances of kidney stones, as it contains oxalates. 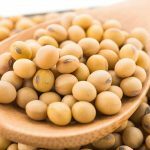 Avoid consuming soybeans if you have bladder cancer or an under-active thyroid. Asthma patients are easily allergic to soybeans. Hope you liked our post on benefits of soybeans. Now that you understood the soybeans nutritional value, we hope you will increase your soybeans intake to reap the numerous skin, hair and health benefits. Don’t forget to share your views in the comments sections below.